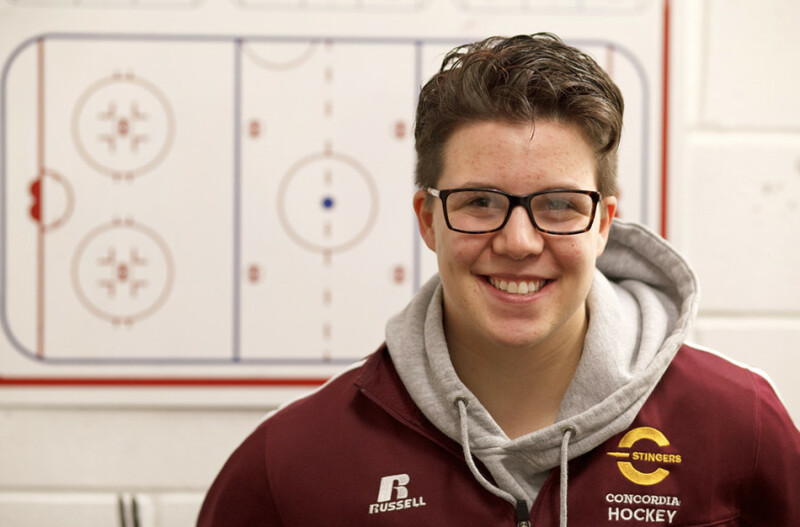 A two-time all-star in North American Prep Hockey Association in 2014 and 2015, Samantha Rhainds scored lots of goals for the Stanstead Spartans—and there are high hopes she’ll bring that power to Concordia this season. But in another sport, she was the one who stopped them from going in. At Stanstead College, a private boarding school located in Stanstead, Que., students are required to participate in three sports during their first year. Rhainds chose to do cross-country running, because her coach told her to get into shape. After that, she became the goalkeeper for the soccer team. “I thought [cross-country running] was too much of an individual sport and I’m a team player, so I went into soccer,” said Rhainds. Despite the fact that she knew she would not to be able to pursue soccer, instead choosing to further her hockey career, Rhainds had nothing but positive feelings for her time as a goalkeeper. “It was nice to try a new sport,” she said. But when she got into university, the soccer goalie said hockey was always her number one choice. “Soccer was more like an experience. It was nice and fun to learn things and all that, but it was always hockey,” Rhainds said. She was one of the most highly recruited players in the summer, with both the Canadian Interuniversity Sport and National Collegiate Athletic Association teams wanting her to commit—but the North American Prep Hockey Association all-star chose Concordia. In university sports, the coaches and teams are used to a cycle of players coming and going, and with many scoring veterans leaving the Stingers women’s hockey team this year, Rhainds will possibly fill that role. She scored 41 points in 39 games in her senior year with the Spartans, and Concordia is hoping she can produce similar results at the CIS level. “As a first year year player she’s learning and adapting to the University game,” said Stingers co-head coach Mike McGrath. “When I came to visit, I was really surprised by the coaches and the way they handled things, and the spirit that the team had. It really felt like home,” Rhainds said about coming to Concordia. Being a Valleyfield native, Rhainds was taught hockey from an early age. Since both her father and brother played, she started learning the game at age five with boys, before eventually playing with girls and getting into NAPHA with Stanstead—hockey was almost a forgone conclusion for her. Six games into this season with the Stingers, the women’s hockey team has won three games, and lost three games. Rhainds, at the moment, has had one assist and no goals in her first season in the CIS. Both Rhainds and the coaching staff believe that the points will come eventually, and that both player and team are going through an adjustment period. Stepping into a new team is not all about scoring points either. Locker room chemistry can sometimes be the difference between a winning and losing team, and Rhainds found no issues meshing within her fellow teammates. She says that the team is already like one big family. Just in her first year with the Stingers, Rhainds has a lot of hope for the team, and hopes that fans will have the opportunity to watch her play for a long time. “I truly believe that we have an incredible team and that it’s going to be stronger than ever,” Rhainds said.